Violinist Paul Arnold, holder of the Lorraine and David Popowich Chair, has been a member of The Philadelphia Orchestra for 32years and is a familiar personality in the Philadelphia classical music scene. He has appeared as a recitalist and chamber musician with such diverse personalities as Yefim Bronfman, Christoph Eschenbach, Tan Dun, Keith Jarrett, the New Arts Trio, and the Emerson Quartet. 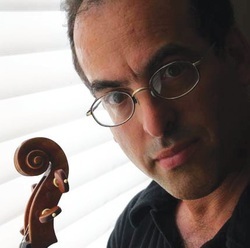 Mr. Arnold has appeared numerous times in the Saratoga Chamber Series directed by Chantal Juillet, where he has worked beside Martha Argerich, Gil Shaham, Truls Mørk, and Sarah Chang. Mr. Arnold has also been featured over 30 times in The Philadelphia Orchestra’s Chamber Music series and Orchestra postlude concerts performing widely contrasting repertoire. Mr. Arnold gives master classes around the country. He has most recently given classes and performed at Cornell University, the University of Colorado at Boulder, and Bucknell University. Before joining The Philadelphia Orchestra, Mr. Arnold was principal second violin of the Rochester Philharmonic Orchestra, with which he made numerous solo appearances. He is a founding member of both the Society Hill Quintet and the widely touring Dalihapa Ensemble and appears regularly with the Network for New Music. For 6 years he served as music director of the Philadelphia Museum of Art Philadelphia Orchestra chamber series showcasing his colleagues and their associates in musical programs pursuant current Museum exhibits. Recently, Mr Arnold was featured in a documentary focusing on his arrangement of a Beethoven piano Sonata for his string Quintet. This Film which included a conversation with Maestro Eschenbach on Beethoven and the nature of transcriptions was included as the intermission feature of an internationally broadcast Live Concert of the Philadelphia orchestra. In the summer of 2010 he was named as an Overseer to the Board of Directors of the Curtis Institute of Music. At Curtis he is a frequent coach of the Curtis Symphony string section. He is also a regular coach at the National Orchestral Institute, a highly regarded training program for gifted young professionals. Paul Arnold is an avid photographer and has given shows in Saratoga New York, summer home of the Philadelphia Orchestra.. His works hang in the homes collectors, conductors and friends...and, yes, his parents. For the last 25 years Mr. Arnold has been years an active lecturer on subjects musical and has given scores of pre-concert talks for The Philadelphia Orchestra. His series “I have a friend in the Orchestra” has delighted concertgoers and has endeavored to break down barriers and enhance the audience’s full enjoyment of the musical experience.